Asia’s import PS markets have followed a downward trend since June this year, disregarding a short-lived rebound in early August. The bearish trend gained momentum by October as PS prices were dragged down by a freefall in upstream markets. 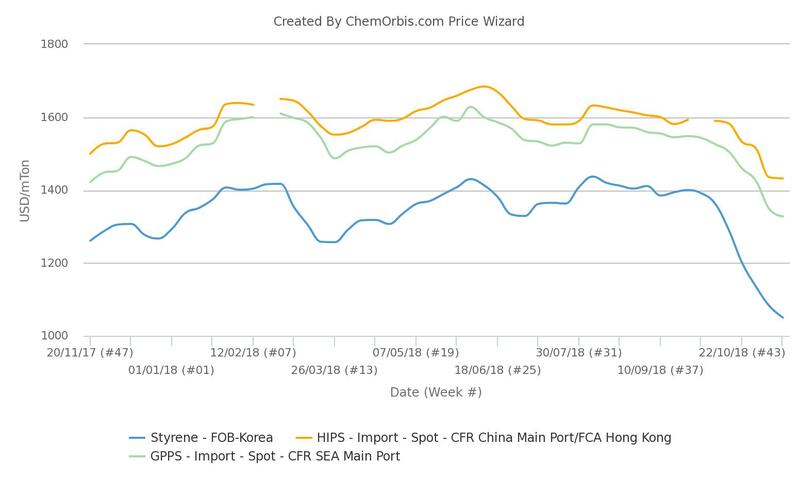 Spot styrene prices have plummeted by around $340/ton since then on an FOB Korea basis and hampered purchasing activity among downstream buyers in the region. According to the weekly average data from ChemOrbis Price Index, import GPPS and HIPS prices have hit more than a year-low both in China and Southeast Asia as of the middle of this month. Producers added to their decreases this week due to the fact that a widespread waiting mood was in place on the side of converters and spot styrene prices dipped to their lowest levels since mid-May, 2017, as can be seen on the ChemOrbis chart above. A different producer in the region issued sharper cuts of $80/ton both for GPPS and HIPS to Vietnam, blaming unsatisfactory demand in the country. Considering the recent gains in oil and ethylene markets, Asian players are now keeping a close eye on styrene in order to have a clue about whether or not the bearish trend would lose pace for downstream markets in the coming term.